Artists: Lizette Campbell, Lorraine Falshaw, Louise Humphries, Sharyn Hutchens, Cathy Jack Coupland, Annette Moylan, Val Tomlins, Paula Trigg. At Timeless Textiles until 11th August. 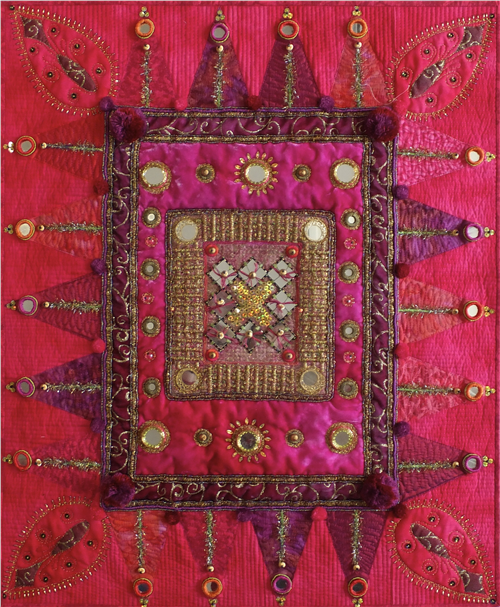 The splendour, skill and enthusiasm of a group of artists dedicated to the bewildering array of techniques associated with textile art are on exhibition at Timeless Textiles. Constructing delicate images, the group of eight women develop an unrestrained dialogue between thread and fabric. Lizette Campbell embellishes with infinite trickery to create outstanding layers of colour and texture. An intricate web of metal thread meanders against a backdrop of white felt suggesting sunset. Clinging to the idea of an urban populace are simple vibrant shapes resolutely strong and dynamic. 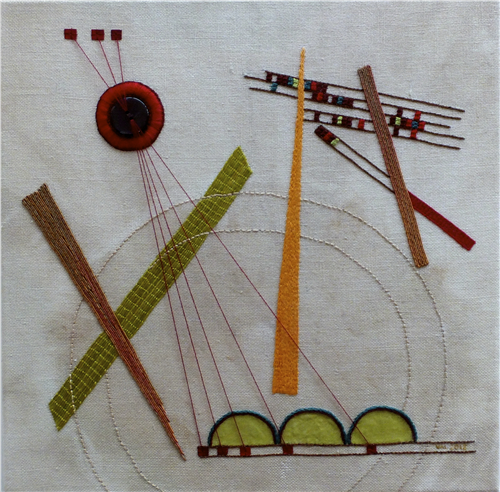 The mixed media on hand dyed linen by Val Tomlins builds perspective and rhythmic structure. Embroidered silk velvet and cotton form a vivacious and exotic piece notable for incorporating shisha mirrors. Cathy Jack Coupland’s cheery slice of available space in the gallery is swathed with dazzling colour. Weaving time and expertise into an embroidered work is an indication of the extraordinary dedication devoted to the practice of this art. 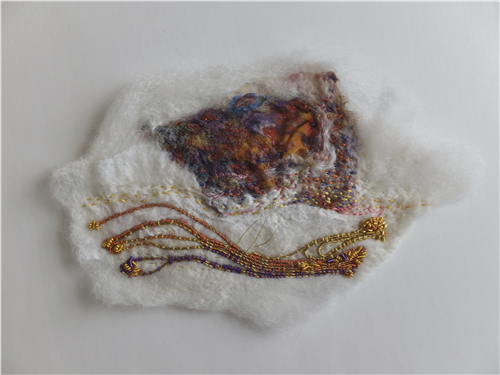 The textile art of The Twenty Ten Group can be seen in their exhibition Diversity at Timeless Textiles until 11th August. The gallery is located at 7 Beaumont St Islington and is open Wed-Sat 10-4, Sun 10-2.
highly recommended exhibition – I spent hours admiring the variety of techniques and exquisite stitching.